Inspired by Ken Burns documentary, we begin our two-week road trip, to visit four National Parks on the West Coast, a bit late on the Sunday afternoon of Mother’s Day in 2010 – Mom comes first. The good news is that we find a wonderful place to eat seafood, Gunderson’s Cannery Café, on the ole pier in Astoria, OR which gets us in the road trip mood. The bar appears to be the only good place to get a meal after 8pm. The cute yurts at Nehalem Bay State Park are our destination for the evening. We are just sad that Molly, who could run off leash on Oregon beaches, is no longer with us after 10 years of visits. The wood framed, canvas yurts have heat, light, decks, and driveways for only $40 per night and can be reserved ahead of time. A42 is a favorite. 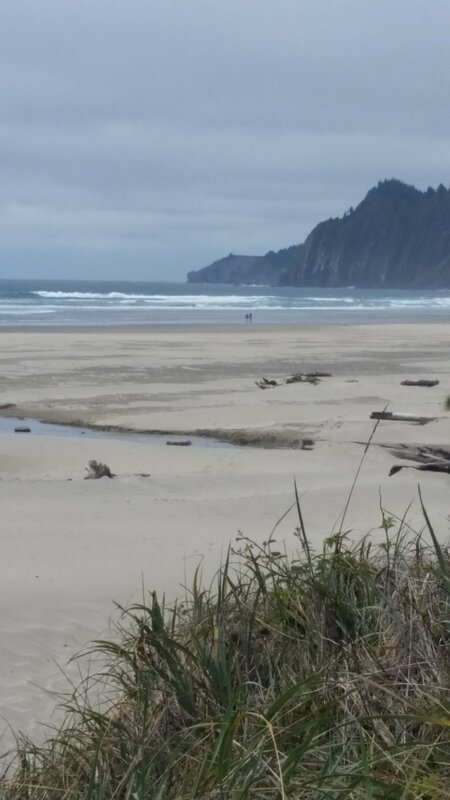 A one mile walk north gets one to lattes and food in low key Manzanita, while the three-mile walk to the north follows a peaceful and remote sandy beach. Don’t tell our “foodie friends” but dinner at Mo’s Chowder House in Cannon Beach, especially at sunset, is our tradition. Casual, fun, cheap seafood is what it’s all about. Tonight, is the second time we have gotten the waiter who does magic tricks! Highway #101 down the Oregon Coast is wonderfully scenic. Logging trucks, bridges, and lots of RV traffic make it less desirable in the summer. Several years ago, I cycled down the Oregon Coast, but I am not sure that I would recommend it today. Although Manzanita to the Redwoods is a bit long for one day of driving, we make it to the Turtle Rocks Inn and are kindly greeted by our hosts. The rooms are very comfortable and spacious with expansive views of the Pacific Ocean, Turtle Rocks, seals, and often (we hear) the gray whales. The pleasing grounds and gardens would be superb in warmer weather. And the breakfasts, served in the common room, are quite tasty. Although the Turtle Rocks Inn can be a little pricey, depending on the time of year, it’s a great home base from which to explore the area. The daily itineraries on the Inn’s website prove invaluable. We enjoy driving the Avenue of the Giants, our first day, stopping along the way for short hikes. Even better is a short but steep, 500 feet in 1 mile, hike to Tall Trees. These massive trees were the inspiration for the creation of the Redwoods National Park. One must stop at the lovely visitor center to get a permit and the code for the gate to get into the Tall Trees. This is where I get my Passport and first National Parks stamp! I wonder if we can really get all 58 National Park stamps in our lifetime? The Fern Canyon, aptly named, is another beautiful short hike. I am thrilled as we drive down to dinner at the Moonstone Grill, another recommendation from the Inn. Sunset and seafood right on the beach, what could be better? We didn’t realize what gorgeous beaches northern California has and wish we had a bit more time to spend on them. Unfortunately, the next day we “enjoy” Eureka, the Lithia Auto Dealership, and the Sherriff who pulled me over for “erratic driving”. I was doing donuts in the street which I thought to be a parking lot, trying to identify the horrible noise in the Volvo. At the same time, we really do enjoy lunch on the sunny deck at the working marina in Eureka between shuttles back and forth for car repairs and a rental car. Driving down Highway #1 to San Francisco from the Redwoods is fantastic and even a little scary for those with a fear of heights like me. A picnic lunch overlooking the Ocean in Mendocino is great and so are the sandwiches from the Harvest Market. Again, this is quite a long day and would be more doable if car pick up and rental car issues in Eureka weren’t involved. In Golden Gate Park we savor the Japanese Gardens along with tea and a snack, the 1912 Conservatory with it’s wonderful plants and history, and the Botanic Gardens. As always, we enjoy exploring Cow Hollow and the shops and restaurants on Union Street. The ferry to Sausalito is very scenic, but the ferry itself could really use some TLC! The trouble is that you can take the ferry over for dinner but have to take the bus back which actually worked out ok. The Sand Piper Restaurant is a good choice for dinner – again, in the bar. It’s right on the water so the views are wonderful, especially of the pelicans dive bombing for their own dinner. Getting out of San Francisco is surprisingly painless. 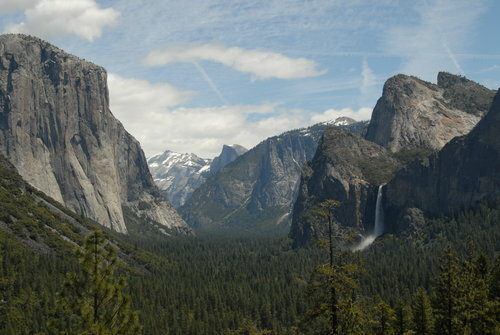 We are greeted with incredible rock formations and waterfall views as we drive into Yosemite! There are four types of lodging in Yosemite. The wonderful historic Ahwahnee hotel for a mere $500 per night, Yosemite Lodge for approx $200, Curry Village for $100, and the Housekeeping Units which are basically a sheltered camp site with showers for under $100. The lodging was mostly booked months ahead of time and now we know why. The place is absolutely packed even mid-week in May. The Yosemite Valley feels like nature’s Disneyland with shuttles, food courts and shops. Being one of the iconic Parks, the visitors are from all over the world. We stayed in a heated (add $30 per night) tent cabin in Curry Village just a foot from our neighbors. There are lots of bear pre-cautions, showers, a food court, and a great climbing shop in the village and yes, I went shopping! Hiking up to Vernal Falls, 1.5 miles and 1,000 feet of elevation, was spectacular but a bit like Tom’s trip to China in relation to crowds. Mirror Lake is a nice 2 mile walk and the whole Valley is a 16-mile loop on a road bike, my activity each morning. I treat Tom to a four-hour photography class through the only Ansell Adams Gallery, which is in Yosemite right next to the visitor center, (where I get my 2nd stamp). His class focuses on lighting. It’s one of the best values of the trip for $95. It takes all day to drive to Redding California but Logan’s Roadhouse is a good find once we arrive. It’s one of those places you get to throw peanut shells on the floor and the food is pretty good. Who knew that Redding California would be so fun! I was excited to see the largest Sundial and a Bridge designed by Santiago Calatrava, an accomplished architect who I saw lecture at the University of Washington. Turtle Bay Park is an impressive civic project with a wonderful Botanic Garden and a super trail along the Sacramento River. Too bad the place is like an oven in the summer and we had to move on to Mt Shasta. The Best Western in Redding is good for laundry and that’s about it but the Tree House Best Western in Mt Shasta is now a favorite. Our room has a fantastic view of Mt Shasta, the breakfast is great, and so is the indoor pool and hot tub - a surprise. A nice grocery store and movie theatre are within walking distance. However, cycling up to Mt Shasta ski area is not what I hoped for due to the rough chip seal road and heavy logging traffic. As the clouds and rain roll in, we point the Volvo toward Mt Lassen Volcanic National Park and our third stamp! I had never really heard of Mt Lassen Volcanic National Park prior to planning this trip but it is very interesting. It’s the only place where you can see and learn about all four types of volcanoes; cinder cone, plug, shield, and composite, here in the West. Mt Lassen blew up big time in 1915 and was made a National Park by President Roosevelt when they figured out how important the area was after the eruption. There is a lot of hot bubbling water and snow, so we hike up the plowed road without cars bt with spectacular views. There are only two other visitors in the movie with us at the visitor center - a nice change from the hordes of people in Yosemite. Crater Lake has lots of snow (ie 600 inches) until July and we hit the drive up during a snowstorm with problematic windshield wipers! This is where I should have done some more research. The good news is that it clears up enough to actually see the lake since Tom has never seen it. Finally getting to stay in the regal, re-modeled Crater Lake Lodge is a real treat. But, the only real activity is snowshoeing, and we are kind of done with winter. Dinner is good (and the only option) in the lovely dining room but a bit pricey. The 33 miles rim road which I had hoped to cycle must wait until July and so must the 1.5 mile 1500 feet downhill hike to the Ranger guided boat trip around the lake. Highway 62 is open to Rim Village and the Visitor Center all year around but you can’t get all the way through the park until July. Good news is that I got my 4th National Parks Stamp! We had planned on staying at Crater Lake two nights but decide to get home and avoid the I-5 Southbound Sunday mess. Highway #138, the highway of waterfalls, is our route over to I-5. Toketee Waterfall is closed due to a slide in 2008 but the other waterfalls are gushing during the heavy spring runoff. Watson Falls is the best via a short uphill hike. Lunch at the Steamboat Inn is quite good and Tom gets to see the North Umpqua River and learn about the 33 miles of protected waters for catch and release fly fishing. Being from Colorado, he is confused about the focus on Steelhead fly fishing. One might spend a whole winter, in the rain, trying to catch a Steelhead but never get one - like our waitress. I have stayed here before on a cycling trip and it’s a wonderful place with comfy cabinlike rooms and decks with views of the River along with a unique wine dinner. So, ends our adventure with the long haul back on I-5. I now have four stamps in my National Parks Passport Book, lots of good memories, and I was even out of cell and email range the second week! This fantastic trip sent us on on our way to visit all 59, now, National Parks! Long before travelwithjanice.com was established, I wrote this, my first, travel blog. I'd like to think future posts have gotten better and more storylike with practice after a travel writing class. In April of 2018 I added pictures and proper links to this post. I hope you find it somewhat helpful.